The Pharmacy and Food Science CRAI Library provides comprehensive materials for teaching and research activities at the Faculty for the courses: Pharmacy, Human Nutrition and Dietetics, and Food Science and Technology. Its collections include the Grewe Collection on food and gastronomy. And the other one is located in Verdaguer building of Torribera Food and Nutrition Campus. This one is in Santa Coloma de Gramanet and has the documentation related in food science. Get to know the CRAI Library. Diagonal Knowledge Campus. Get to know the CRAI Library. 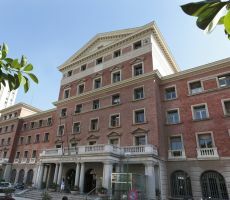 Torribera Campus. Library guide. Diagonal Knowledge Campus. 2 study rooms (with 1 computer). Reserve a room.